Leisure, Structure & Society "The first thing to be said about leisure is that it is not new." (Torkildsen) There have been many different interpretations of leisure in the past, some of which still exist in today's world. Although there are so many definitions not one can be deemed as right or wrong. This is due to the fact that leisure is continually expanding and certain aspects of people's lives incorporate a certain part of a theorist's definition. 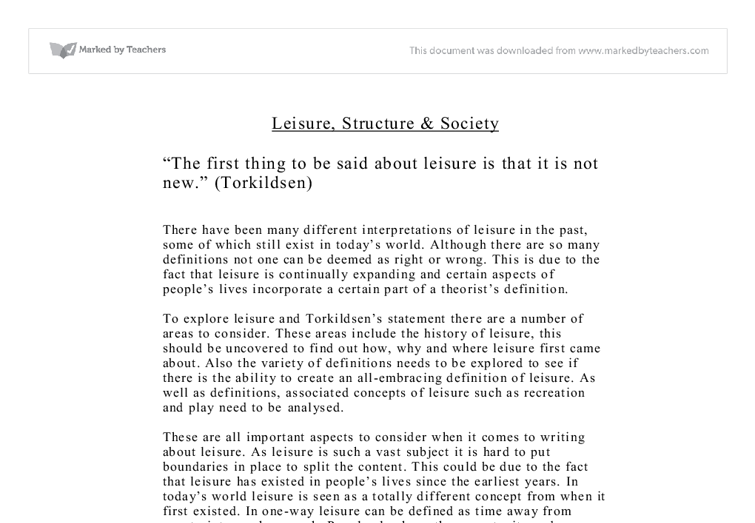 To explore leisure and Torkildsen's statement there are a number of areas to consider. These areas include the history of leisure, this should be uncovered to find out how, why and where leisure first came about. Also the variety of definitions needs to be explored to see if there is the ability to create an all-embracing definition of leisure. As well as definitions, associated concepts of leisure such as recreation and play need to be analysed. These are all important aspects to consider when it comes to writing about leisure. As leisure is such a vast subject it is hard to put boundaries in place to split the content. This could be due to the fact that leisure has existed in people's lives since the earliest years. In today's world leisure is seen as a totally different concept from when it first existed. ...read more. This has now seen a decline in the power of the Catholic Church and a greater interest in humanity and performing arts. During the industrial revolution there have been lots of changes in the development of leisure. Many cities grew around factories meaning there would be little space for recreational facilities. There was also still a class structure in place, which meant many of the working class would have no time to participate in leisure, "Time or lack of it was also a major restriction. The customary twelve to fourteen hour work day, six days a week, left little time for play." (Baker) A big change came about when people influenced the government to adopt a half-day during the working week. This was seen as a turning point for leisure and also influenced an explosion in growth and participation of leisure. "Workers even created their own holiday, St. Monday, when they refused to go to the factory, but instead stayed at home to recover from a weekend drinking spree." (Baker, W. 1988:105) The present leisure industry is worth �1.7 billion per week. This is largely due to the development of leisure through the ages. As time has passed through the eras there have been many different definitions of leisure, although there is not a "perfect" definition many can be linked together to form a relatively precise one. ...read more. Leisure and play is an important aspect of everyone's lives, and has a personal meaning for each person, as everyone has a different aspect of how they like to enjoy themselves and have fun. There is no all round definition of play or why people play, but some theorists say there is a link between stress levels and playfulness, therefore suggesting the more fun people have the lower their stress levels will be. Parry 1977 suggests: "leisure is a social phenomenon itself, involves social constraint and social obligation and can best be thought of as being embodied in a whole way of life, such an idea immediately invokes the concept of culture." This suggests that leisure is affected by an individual, there choice of activities and affects the way they live their life. 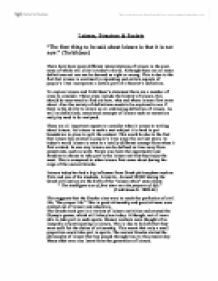 Evidence to suggest that Torkildsen's statement is correct and that leisure is not new, can be seen from the leisure industry being worth �1.7 billion per week. For the leisure industry to be worth this much, it would have had to build up over time. Therefore all historical eras have played a big part in the way today's leisure can be defined. With many new and exciting activities in the world today people can create their own meaning of leisure which is personal to them, this meaning would have been adapted through generations and will continue to flow through life. ...read more. The three types of fat are: 1. Saturated fats - normally found in animal fats and are liquid at room temperature; usually called oils. 2. Polyunsaturated fats. 3. Monounsaturated fats. These figures are percentages of dietary energy. As alcohol also provides energy, the figures in brackets refer to those people who have no energy intake as alcohol. Levels of Fitness My fitness at the moment is at a reasonable level although I would not class myself as super fit. I smoked for 8 years before starting this course and have managed to successfully quit for just under a year with no desire to start again. the Association, for which all clubs belonging to the Association should be invited to compete". The F.A. Cup, football's first national tournament, was born. Fifteen clubs competed in the first F.A. Cup in 1871-72 and the notion of competition in football spread rapidly. There are three important parts of the skill of passing that a netballer needs to develop: * The technique of the various throws. * How to place a pass accurately * The ability to select the most appropriate throw, during play. It takes more than a week to achieve a habit change in basketball shooting. You may have heard a player being referred to as "unconscious" while hitting shot after shot in a game. Great shooting has to be done from developed habits that don't require mental preparation during the act. So I asked Dale whether it was an important game? To which he replied, "Yes as you know it's against Truro who have been our rivals since I can remember, they beat us in the last game of the season 3 years ago to grab promotion".